March 21, 2019: PhD Student, Michelle St. Pierre, received a Trainee Spotlight Award from the CCIC and will present on cannabis and acute pain in Toronto this week. Read more here. March 9, 2019: Dr. Celia Morgan will be visiting UBC Okanagan to present on Psychedelic Drugs in the Treatment of Addiction: The Case of Ketamine. Please join us on March 29 from 3:30pm-5pm to learn about the current state of evidence for ketamine in the treatment of addiction. November 28, 2018: Top researchers, including Dr. Walsh, are calling on the DEA and NIDA to reevaluate the scientifically scant FDA 8-factor analysis of kratom. Click here to view the letter on Cision. October 30, 2018: Do-it-yourself cannabis edible kits should be approached with caution. As Dr. Walsh says, “if you eat [cannabis], it comes on slowly and there’s no turning back.” See the article in the Toronto Star. October 17, 2018: Pot is legal. Is it time to redefine sobriety? Dr. Walsh explores the nuances of sobriety and different states of consciousness in this Walrus article. October 17, 2018: Ever wonder why music sounds so good high? Dr Walsh explains why in this CBC article. October 16, 2018: How cannabis legalization will change research –Dr. Walsh and CBC. October 10, 2018: One week until non-medical cannabis is legalized in Canada and CTV spoke with Dr. Walsh and our friends from CSSDP about what cannabis legalization means for campuses across the nation. September 28, 2018: Head down to the Cannabis Hemp Conference and Expo in Vancouver (September 28) to catch Dr. Walsh speaking on medical cannabis. September 5, 2018: We recently wrote an article summarizing some of the previous and ongoing research examining cannabis use in the treatment of trauma-related disorders. Visit Chacruna to read more. September 4, 2018: With cannabis legalization quickly approaching, Canadian campuses are introducing an array of new and updated policies to accommodate the changing drug policy landscape. Dr. Walsh recently stated “I think it’s going to have a positive effect on Canadian campuses where people are using cannabis anyhow”. Read more here. July 23, 2018: Dr. Walsh and colleague Dr. Ethan Russo tackle the question of whether CBD is psychoactive or not. See what they had to say in this interview with The Leaf. June 21, 2018: Nine scientists, including Dr. Walsh, delivered a co-authored letter to the U.S. Senate and House Leadership condemning the FDA recommendation for scheduling of the natural plant as a Schedule I banned substance, and urging the DEA to return the recommendation to the FDA for further study and development of appropriate regulations to preserve consumer access for the 3 – 5 million kratom users in America. Read it here. June 11, 2018: Dr. Walsh spoke to CBC about a recent Health Canada raid of an Edmonton kratom retailer. June 8, 2018: We recently published an article that examined the association between the use of psychedelics and partner violence. See our media page for more coverage. June 2, 2018: New research on cannabis and PTSD suggests that those who use cannabis report lower levels of depression and suicidality when compared to those who do not. Dr. Walsh commented on the research in the Globe and Mail. May 8, 2018: Dr. Walsh has been invited to present to the Subcommittee on Veterans Affairs in the Senate tomorrow at 9am. View the webcast here. May 3, 2018: Did you see Dr. Walsh and colleagues open letter to Kellyanne Conway about the scheduling of kratom in the USA? You can read it here. April 25, 2018: Read about the on-campus harm reduction advocacy work of graduate students in the lab. April 5, 2018: Check out the Grassroots Expo this weekend in Vancouver. Dr. Walsh and colleagues will be speaking on a number of interesting topics including, cannabis and pain management, and cannabis and mental health. February 23, 2018: UBCO becomes the second university in Canada to cover medicinal cannabis for students in a one year trial period, thanks in part to the advocacy work of graduate students in the lab. See our media page for coverage on this outstanding development. February 19, 2018: Dr. Walsh speaks out against the U.S. Food and Drug Association’s alarmist article on kratom, and its potential use as a treatment for opioid withdrawal symptoms. January 31, 2018: Dr. Walsh was quoted in an advice column regarding potential long term health effects of frequent cannabis use, and how legalization will offer the chance to learn more about associated risk. January 25, 2018: On Wednesday, January 24. Dr. Walsh was interviewed by The Globe and Mail, on the announcement that the federal government is giving $1.4 million in cannabis research grants, and on Dr. Walsh receiving one of the grants. 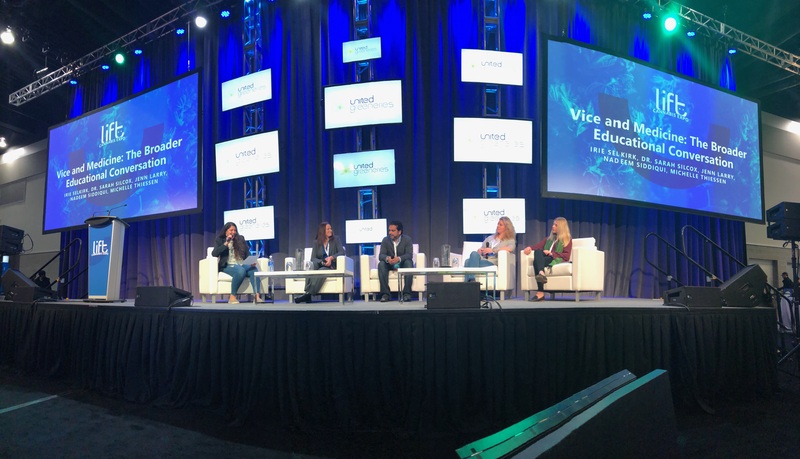 January 14, 2018: This past weekend, graduate student Michelle Thiessen spoke on a panel at the Lift Cannabis Expo where she shared about educating young people about cannabis. See a photo of her and the other panelists here. January 10, 2018: Our lab has partnered with Eden Medicinal Society to help evaluate their ongoing Opioid Substitution Program in Vancouver Downtown Eastside. The Globe and Mail highlighted this program in a recent article on the opioid crisis.